The game does not seem to have any particular direction in terms of story, which is not necessarily a bad thing, but it seems to just kind of gloss over it. There is no real reason why you are teleporting through space into these different locations and eradicating the population. Perhaps you are the bad guy in the situation and everyone was doing just fine without you. Solid gameplay with great graphics too. A strong sense of the MegaMan style which is bound to keep you playing again and again. The difficulty scaling is a little too extreme at the moment. While the game is based around being difficult, you have to be able to get through some levels in order to continue. Overall, a really great game that should only improve over time. While having a really solid core game experience, only tainted by some levels that are next to impossible, an easy pickup for anyone who enjoys the old school platform style of games like MegaMan. Just remember to not having any small objects accessible to you while playing because they may end up thrown. "Tutorial complete, prepare to die". Never have I read a more true yet blunt statement given to me in a video game. This game, by no means, is not directed towards the impatient, easily frustrated, or quick to give up. If you consider yourself as a game who continues to go on no matter how unfair that fire trap may be, then you may have just found your next game. With a unique blend between the famous MegaMan and the infamous The Binding of Isaac, 20XX always seems to drag you back in. While the gameplay overall is outstanding, there are still some problems with the difficulty scaling. The game is meant to be difficult, by no means expect to taste victory the first time picking up the controller, but at the same time some levels are just impossible. There are some paths that can be taken that will reward you with upgraded weapons, or money that you can use on upgrades, but more often than not they require you to run and jump through fireballs that will eventually just kill you. So, in the end you are left wondering if it is even worth trying to get the upgrades. The user interface is pretty straight forward and quite easy to grasp. The menus are clean and crisp, which is important when attempting to find something when needed. The in game interactions are not as clear, but easy to understand once you begin to see all of the icons. The first time that I saw three giant bolts I was intrigued, and I eventually found out that it represents money for upgrades. The first time that I saw a new icon I felt the obvious need to touch it to see what it does, which usually led to my death rather than success, but that is part of the fun in the game. 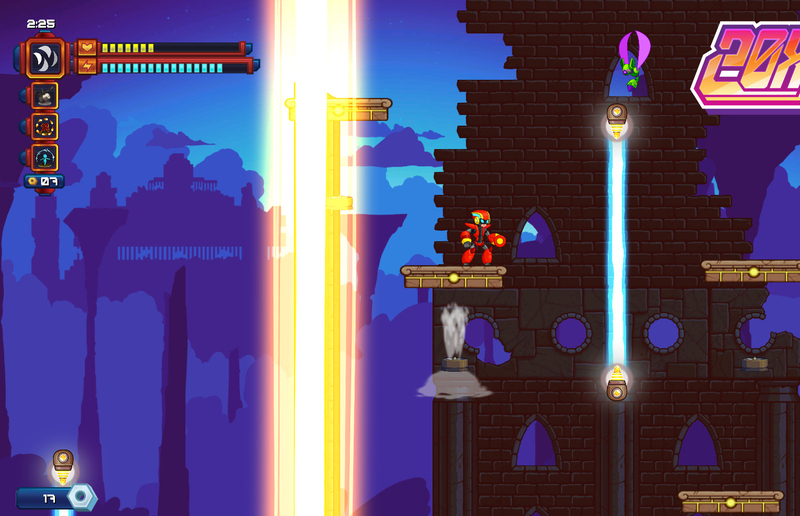 Boasting an old school style of graphics that is seen in platform games through time, the overall impression is nice. Everything seems to flow very smooth, which is important when jumping from one death beam to the next within fractions of seconds of one another. Dangerous objects are usually shown in a different color shade that stands out a little bit from the level, which is clear to the player. I am not sure what other types of sound that could really accompany a game such as this. Hitting the nail on the head with the different sounds is just another piece of the puzzle that explains why this game is so much fun to play. Your character makes a wide array of noises between shooting, jumping, picking stuff up, or simply dying. Even the background music that plays while you jump around like a crazy person is entertaining enough to keep you in the rhythm of the game. While it would be nice to hear more unique sounds come from enemies, there is plenty enough already that there is no void that needs filling but rather only improvement at this point. One of the things that makes the game a bit more difficult is the randomness of the level before you enter. This allows the player to feel like they are traversing a new level each time that they play. This removes the ability to "learn a level", which always keeps things new and fresh. In a game such as this, it is the randomness that you encounter that inspires suicidal tendencies for your character, and always leaves you curses the developers for making something so cruel.